Bliss Divine is an immortal work, a legacy for ages to come. It is a spiritual classic. It is a Bible for the Christians, a Bhagavad-Gita for the Hindus, a Koran for the Muslims, a Zend-Avesta for the Parsis. It sums up the teachings of all scriptures of all ages. 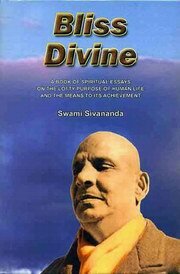 Through this present volume "Bliss Divine" Sri Ananthanarayanan has presented to modern India a rare compendium of spiritual wisdom and brought to the educated classes a comprehensive yet choicest collection of Sianandaji's teachings to present-day humanity. The essence of our country's culture and ideals is contained in this beautiful compilation of his. He has put us all into a deep debt of gratitude which we can only repay by making this "Bliss Divine" our life's Guide and Companion. Bibliographic Information: xxiv + 528p. Gloss.